Enabling you to mount it against your kitchen walls, the Kent Gold UF Storage Water Purifier's cutting edge technolgy runs on the superior ultrafiltration technology. KENT In-Line Gold has a unique compact design, which is suitable for wall mounted installation. KENT In-Line Gold is based on a superior state-of-the-art UF (0.01 micron Ultra Filtration) technology which removes harmful micro-organisms such as bacteria, viruses and cysts. The high flow-rate of the UF membrane allows fast purification. KENT In-Line Gold works without electricity and removes chemicals such as chlorine for purification of water, thereby making water safe and healthy for consumption. 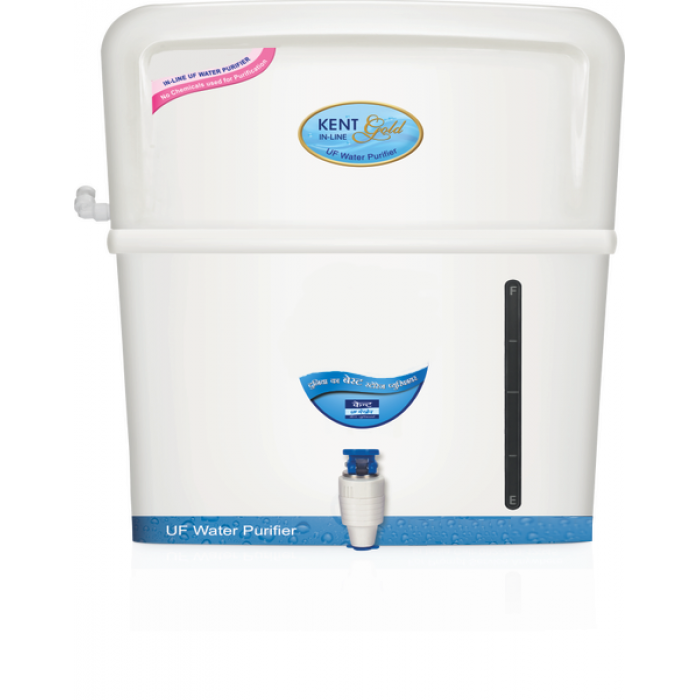 KENT In-Line Gold has 7 litres of purified water storage capacity. The storage tank ensures continuous fast supply of purified water even in the absence of electricity or running tap water. First in the industry, the Aqua Kent Gold UF membrane housing is spin-welded using the latest technology, which ensures high quality permanent joints. Welded housing also prevents tampering and improves membrane life. ll the fittings and components in the purifier are push (snap) fit to prevent leakages and wastage of water. Additional protection against leakages is built-in by using rubber O-Rings inside the push-fit fittings.